(Nanowerk News) A project designed to make the region's and nation's electric grid more reliable and efficient will be showcased today during an event at the University of Washington where students will be able to view how they are using energy in real time. The UW project is one of 11 projects across five Northwest states that comprise the Pacific Northwest Smart Grid Demonstration Project, a public/private demonstration launched in February 2010. Sponsored by the Department of Energy's Office of Electricity Delivery and Energy Reliability, and co-funded by the participating utilities, the demo is beginning a two-year period of collecting energy use data. The 11 participating utilities will evaluate the benefits of smart grid technologies locally — in their respective cities — and at the regional level. The project team will look at how a smarter grid can help deliver electricity more efficiently to avoid congestion in the transmission system and how more wind power can be used. The project's data collection and analysis efforts are expected to provide an unprecedented view into how smart grid concepts can provide regional benefits while improving consumer choice and reliability locally. 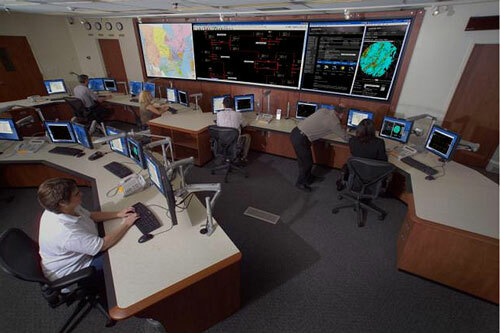 The Electricity Infrastructure Operations Center at PNNL is a user-based facility dedicated to energy and hydropower research, operations training and back-up resources for energy utilities and industry groups. "The two-way information exchange in the Pacific Northwest Smart Grid Demonstration Project allows grid operators to make the existing electric grid more efficient — while also exploring how using other technologies, such as energy storage devices, smart appliances and wind power, can bolster the reliability of our system," said Carl Imhoff, Electricity Infrastructure Market Sector manager at Battelle in Richland. Battelle is leading the demonstration project for the DOE's Office of Electricity Delivery and Energy Reliability. "The data we'll gather during the next two years will enable us to evaluate the costs and benefits of a smart grid to consumers in all types of utilities in the Pacific Northwest. We'll also evaluate how we can optimize our power system while, at the same time, adding more variable, renewable energy resources such as wind and solar," he said. The University of Washington has invested nearly $10 million in the project. Before the project began, the UW had seven meters on campus providing a limited view into the campus' energy use. As Seattle City Light's largest customer, the UW has worked with the utility to install more than 200 smart meters across campus in nearly every building. The meters give energy users real-time information and analysis on energy usage and will improve the UW's understanding of how much energy they are using and how efficiently they are using it. At new residence halls on campus, students will have real-time access to their energy use data by way of in-room energy management devices. Graduate students also will be able to gather and study this data for use in classroom instruction. "The University of Washington is recognized as a national leader in sustainability within the higher education community," says UW Provost Ana Mari Cauce. "The project provides an exciting opportunity for testing how 21st century technology can reduce energy consumption. Given our students' keen interest in the environment, it is appropriate that much of our research on smart grids will occur within our residence halls and that the initial research will be conducted by students in our Program on the Environment." At the regional level, the Pacific Northwest Smart Grid Demonstration Project is testing an innovative concept called "transactive control" through information exchanges connecting the 11 participating utilities, each volunteering to participate in the study with the Electricity Infrastructure Operations Center located at Battelle's facilities in Richland, Wash. There, information about demand for electricity, amount of wind power available and wind forecasts are translated into incentive signals, or prices, which are updated every five minutes and sent to participating utilities. This allows contributors to make local decisions on how their piece of the smart grid project can support local and regional grid needs. The Battelle-led project team is using the signal to test a variety of smart technologies in different geographies, in different weather, in different situations, to learn the most they can about how the grid can operate most efficiently. The move to "go-live" with the transactive control signal is the continuation of more than a decade of smart grid research in the Pacific Northwest. "Six years ago in a similar project on the Olympic Peninsula in Washington state we learned that a small group of consumers using a smart energy signal similar to transactive control could save about 10 percent on their monthly power bill and help their utility reduce peak demand by 15 percent," said Imhoff. "Now, we'll be able to see how a broader set of customers, from different climate and geographic regions, can save energy or money, or both." he said. During the Olympic Peninsula GridWise® Demonstration Project, 115 consumers were outfitted with smart water heaters and electric dryers that responded to a smart signal and would intermittently turn their heating elements off, anywhere from 20 seconds to two minutes, during times of peak demand on the grid. Researchers found consumers didn't notice because water would remain hot and the barrel of the dryer would continue to spin during these short periods of time. Researchers also found the impact from those smart devices made a difference in the amount of money consumers paid for power each month, and in the amount of energy saved during times of peak demand on the grid. Project participants are now looking to that intermittency used in a broader scale with a diverse set of smart appliances and an even smarter signal. As a primary partner in the project, the Bonneville Power Administration is leading a regional effort to develop a business case for smart grid — to show which major infrastructure and technology investments will provide the best value to Northwest ratepayers in the long run. "One of the main goals of this smart grid project is to develop the regional cost/benefit analysis," according to BPA Deputy Director Bill Drummond. "And that's important because demonstrating that the benefits of smart grid outweigh the costs is crucial for any utility considering moving forward with these investments." The "go live" event takes place at 10:30 a.m. at Alder Hall Commons, located at 1315 NE Campus Parkway (entrance on NE 40th St. between Brooklyn Ave. NE and University Way NE). U.S. Senators Patty Murray and Maria Cantwell, UW Provost Ana Mari Cauce; Bill Drummond, Deputy Director of the Bonneville Power Administration; and Battelle Senior Vice President and Pacific Northwest National Laboratory Director Mike Kluse will be on hand for the celebration. The Pacific Northwest Smart Grid Demonstration Project was co-funded by American Recovery and Reinvestment Act funding through the DOE, and the project's utility and vendor partners. More information about the project is available at www.pnwsmartgrid.org.